Thrissur to Bangalore: On a Kerala State RTC "Multiaxle"
I was fully undecided about my return journey after my vacation. Air Tickets for Sunday went at high rates, while I couldn't opt for a bus since I needed to be in Bangalore maximum by 4AM on monday. Tickets for buses leaving on Sunday were being sold for astronomical sums as well. I finally decided to take a bus on Saturday instead - and have a nice rest at home on Sunday, so that I can start off fresh on Monday. 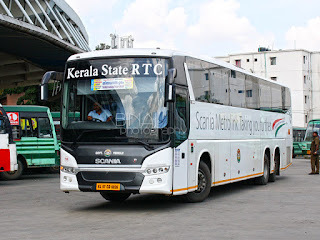 I decided to look for state buses - I hadn't travelled in a Kerala RTC multi-axle buses in a very long time - almost a year! This was the best opportunity for me to try them again - there were four options, and I briefly considered taking the last bus - but ruled out since that bus would reach Bangalore quite late in the morning. 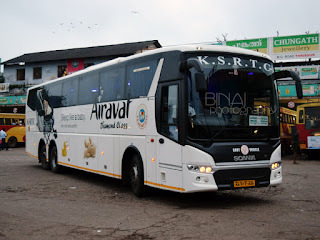 I finally decided to take the last Kerala RTC bus via Salem, which is the 1515hrs Trivandrum-Bangalore service. Booking was done online.